As the Journal of Modern Craft enters its second year of publication, it seems an appropriate time to go back to basics. And so, after a year of trying to push the boundaries, this time round we offer a series of writings that go right to the heart of “modern craft” and its interpretation. In articles by Tom Crook, a historian and theorist of nineteenth-century modernity, and Nicolette Makovicky, an anthropologist and material culture specialist, we are treated to two such methodological inquiries. Crook’s subject, the Arts and Crafts Movement, could not be more familiar to readers of this journal. By reframing the Movement as an ‘alternative modernity,’ however, he breathes new life into that subject. Crook’s account gives us new tools for understanding well worn aspects of the Movement like the debate over machines, medievalism and other forms of historicism, and the growth of interest in indigenous craft traditions from around the world. Of particular interest is his use of Mikhail Bakhtin’s theory of ‘dialogics,’ in which opposing positions and processes are seen as producing one another through continual interrelation, rather than resolving dialectically into new, stable syntheses. Makovicky’s fieldwork among lace makers in contemporary Slovakia has led her to make a closely parallel argument. Just as Crook warns against seeing the Arts and Crafts Movement as either modern or anti-modern, Makovicky refuses the false choice between understanding ‘traditional’ craft either as a fictional construct, or as a fragmentary and threatened anachronism. Rather, she presents the choices made by individual lace makers as conscious responses to modernity, in which change and tradition are constantly reintegrated into one another. 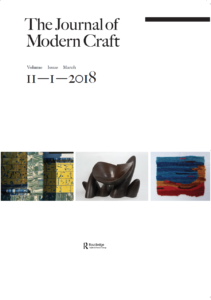 Especially when read together, these two essays exemplify this journal’s ambition to chart new methods in the study of modern craft, both by turning over old soil and ploughing new fields. Much the same could be said about the prominent place given to British ceramics in this issue. Art historian Penelope Curtis outlines an unexpected comparison between the most famous name in English pottery—Bernard Leach—and the sculptor Barbara Hepworth. For many decades these two figures lived near one another in St. Ives, a small town in the west of England, but a notional art/craft divide prevented scholars from drawing connections between them. Interestingly, readers may feel that of the two, it is Hepworth who seems the more committed to the form-giving possibilities of handwork; but in any case, Curtis shows how the vessel form that forms the heart of studio ceramics can be seen afresh as it moves across disciplines. 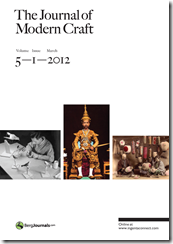 Ceramics is also the focus of this issue’s Primary Text and Statement of Practice. In pairing David Queensberry and Alison Britton, we have intentionally taken a step back into the politics and possibilities of the 1970s. At that time Queensberry, a leading designer within the ceramic industry, was Britton’s tutor at the Royal College of Art. Despite his emphasis on functional design, she and many of his other students (including Carol McNicoll, Jacqueline Poncelet, and Elizabeth Fritsch) set off in a diametrically opposed direction. Britton turned to handbuilding, pattern and decoration, and fragmentary composition to forge a powerful new postmodern sculptural idiom. Now, thirty years later, it is Britton who teaches ceramics at the Royal College of Art. Her statement, written with the benefit of hindsight looking back at a long and successful career, describes her studies with Queensberry as the beginning of a journey of formal and conceptual experimentation. Queensberry, too, has stuck to his guns. We have reprinted a talk he delivered back in ’75, in which he expresses alarm at the direction that young ceramists seem to be taking. In a new preface to this lecture, he reaffirms his convictions, arguing that the global transformations in production that have happened since make the teaching of design skills more important than ever. Queensberry’s and Britton’s positions reprise the old debate: should craft be oriented to design or fine art? But both write in full awareness that those two frameworks of reference are themselves fluid and unpredictable. The issue’s final article brings to our pages the work of Julia Bryan-Wilson, one of the most exciting new scholars working at the intersection of art and craft history. The lesbian identity politics that she locates in the work of Harmony Hammond might initially seem distant from modern craft’s fundamental concerns, as discussed elsewhere in this issue. But it is telling that Hammond, too, sought to break down false distinctions: “between painting and sculpture, between art and women’s work, and between art in craft and craft in art,” as she put it. In Bryan-Wilson’s analysis, Hammond looked to craft not as a reassuring source of identity, nor simply as a tool of Feminist critique, but rather as a means of queering seemingly stable oppositions and thus opening up new discursive possibilities. Finally, we have the pleasure of announcing two new initiatives at the Journal of Modern Craft that are intended to embody this spirit of ongoing dialogue. This issue is our first to include a Response to a previously published article. We actively encourage such contributions, and hope to be able to feature other commentaries by our readers in future issues. Also, we are glad to be able to announce the launch of a new website at www.journalofmoderncraft.com. This new digital interface will carry selected content from the journal, and will also provide useful links, blog posts, and an open forum to which all our readers can contribute. Academic publishing is a slow and careful affair, and any scholarly journal—no matter how multiple and inventive—runs the risk of instituting a new orthodoxy. By actively promoting dialogue through printed and digital means, we hope to avoid this, and thus to do justice to the subject of modern craft, which is always on the move.